Today begins one of the most dangerous missions that humanity has ever attempted, the removal of over a thousand nuclear fuel rods from Reactor #4 at the damaged Fukushima Dai-ichi power plant in Japan. The potential release of radiation is beyond anything that we have experienced before. We can only hope that everything goes smoothly with this operation, which could take years. At the same time, an even greater disaster is slowly and relentlessly unfolding around us each day, through the many ways we are comprising the planet’s biosystems and making irresponsible short-term decisions. We are clearly living out of balance with the earth. Today, modern society is desperately searching for ways to be more sustainable. The indigenous elders of the earth already have the answers, and are begging us to listen. We, the Original Caretakers of Mother Earth, have no choice but to follow and uphold the Original Instructions, which sustains the continuity of Life. We recognize our umbilical connection to Mother Earth and understand that she is the source of life, not a resource to be exploited. We speak on behalf of all Creation today, to communicate an urgent message that man has gone too far, placing us in the state of survival. We warned that one day you would not be able to control what you have created. That day is here. Not heeding warnings from both Nature and the People of the Earth keeps us on the path of self destruction. This self destructive path has led to the Fukushima nuclear crisis, Gulf oil spill, tar sands devastation, pipeline failures, impacts of carbon dioxide emissions, and the destruction of ground water through hydraulic fracking, just to name a few. In addition, these activities and development continue to cause the deterioration and destruction of sacred places and sacred waters that are vital for Life. Powerful technologies are out of control and are threatening the future of all life. The Fukushima nuclear crisis alone is a threat to the future of humanity. Yet, our concern goes far beyond this single threat. Our concern is with the cumulative and compounding devastation that is being wrought by the actions of human beings around the world. It is the combination of resource extraction, genetically modified organisms, moral failures, pollution, introduction of invasive species, and much much more that are threatening the future of life on Earth. The compounding of bad decisions and their corresponding actions are extremely short-sighted. They do not consider the future generations and they do not respect or honor the Creator’s Natural Law. We strongly urge for the governmental authorities to respond with an open invitation to work and consult with us to solve the world’s problems, without war. We must stop waging war against Mother Earth, and ourselves. The sanctity of the Original Instructions has been violated. As a result, the Spiritual People of the Earth were called ceremonially to come together at the home of the Sacred White Buffalo Calf Pipe Bundle. These Spiritual Leaders and those that carry great responsibility for their people from both North and South America came together with the sacred fire for four days at the end of September 2013 to fulfill their sacred responsibilities. During this time it was revealed that the spirit of destruction gained its’ strength by our spiritually disconnected actions. We are all responsible in varying degrees for calling forth this spirit of destruction, thus we are all bound to begin restoring what we have damaged by helping one another recover our sacred responsibility to the Earth. We, the Original Caretakers of Mother Earth, offer our spiritual insight, wisdom, and vision to the global community to help guide the actions needed to overcome the current threats to all life. We only have to look at our own bodies to recognize the sacred purpose of water on Mother Earth. We respect and honor our spiritual relationship with the lifeblood of Mother Earth. One does not sell or contaminate their mother’s blood. These capitalistic actions must stop and we must recover our sacred relationship with the Spirit of Water. The People of the Earth understand that the Fukushima nuclear crisis continues to threaten the future of all life. We understand the full implications of this crisis even with the suppression of information and the filtering of truth by the corporate owned media and Nation States. We strongly urge the media, corporations, and Nation States to acknowledge and convey the true facts that threaten us, so that the international community may work together to resolve this crisis, based on the foundation of Truth. We urge the international community, government of Japan, and TEPCO to unify efforts to stabilize and re-mediate the nuclear threat posed at the Fukushima Dai-ichi nuclear power plant. To ensure that the Japanese government and TEPCO are supported with qualified personnel and information, we urge the inclusion of today’s nuclear experts from around the world to collaborate, advise, and provide technical assistance to prevent further radioactive contamination or worse, a nuclear explosion that may have apocalyptic consequences. The foundation for peace will be strengthened by restoring the Original Instructions in ourselves. Prophecies have been shared and sacred instructions were given. We, the People of the Earth, were instructed that the original wisdom must be shared again when imbalance and disharmony are upon Mother Earth. In 1994 the sacred white buffalo, the giver of the sacred pipe, returned to the Lakota, Dakota, and Nakota people bringing forth the sacred message that the winds of change are here. Since that time many more messengers in the form of white animals have come, telling us to wake up my children. It is time. So listen for the sacred instruction. All Life is sacred. We come into Life as sacred beings. When we abuse the sacredness of Life we affect all Creation. The text of the statement can be found here. 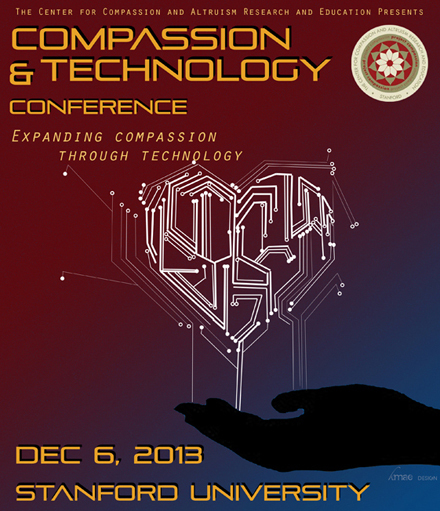 On December 6, 2013, Stanford University’s Center for Compassion and Altruism Research and Education (CCARE) is holding the inaugural Compassion and Technology Conference at the Stanford Medical School in Palo Alto, California. Scientists, engineers, social entrepreneurs, and compassionate people will converge at Stanford University for discussions and presentations on the cutting edge of compassion. Plus there is a contest to design technology to enhance compassion. The conference is a collaboration with CCARE, Facebook, 1440 Foundation, HopeLab, and The Dalai Lama Foundation. The conference’s purpose is to support a dialogue around innovative practices on compassion and technology. Expert researchers and technology leaders who have successfully implemented and fostered compassionate action through the use of technological advancements will present talks on compassion. Conference attendees will learn how compassion can be trained using technological education tools, tracked geographically through mapping tools, used to inspire, and implemented as an intervention in communities where it is most needed (e.g., war zones, prisons, at-risk schools, trauma populations, and healthcare systems). “While compassion is a fundamental part of every religious tradition, there is an ever enlarging body of scientific evidence that technological advancements have an immense positive impact in terms of increasing compassion and altruistic behavior on both the community level and the individual level. This conference will highlight these aspects from a technological aspect as well as a scientific aspect in an effort to promote awareness and progress, and reward those who are working towards these goals. We at CCARE are very excited to initiate and sponsor the conference and contribute to this expanding field,” says Dr. James Doty, Founder and Director of CCARE. The Compassion and Technology Contest calls for innovators, engineers, and designers to present a technology design or product that will help people learn, practice, or improve qualities of compassion, empathy, social connectedness, or altruism. Some examples of compassionate technology are a website using knowledge from compassion science to help “build compassion muscles”, compassion education apps, and compassion-inducing video games. 1. Help people learn, practice, improve, and share one or more of the following qualities: compassion, empathy, social connectedness, altruism. 2. Use technology (broadly defined as tools, apps, social media, etc.) to effectively reach a wide audience and increase the scalability of the idea. 3. Apply to one or more of the following areas: learning, practicing, increasing, and spreading compassion. 4. Are easy to use, so that people without technology expertise can easily access and use it. 5. Are scalable, sustainable, and financially viable.